Hydrostatic lubrication is characterized by the complete separation of the conjugated surfaces of a kinematic pair, by means of a film of fluid, which is pressurized by an external piece of equipment. Its distinguishing features are lack of wear, low friction, high load capacity, a high degree of stiffness and the ability to damp vibrations. 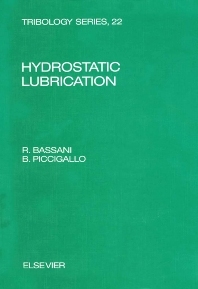 This book reviews the study of externally pressurized lubrication, both from the theoretical and the technical point of view, thereby serving the needs of both researchers as well as students and technical designers. In this connection, design suggestions for the most common types of hydrostatic bearings have been included, as well as a number of examples. A comprehensive bibliography is included with each chapter providing up to date references for more in depth coverage. 1. Hydrostatic Bearings. Working principle. Advantages and drawbacks. Applications. Types of bearings. 2. Compensating Devices. Direct supply systems. Compensated supply system. The commonest supply systems. Hydraulic circuit. 3. Lubricants. Mineral lubricants. Synthetic lubricants. 4. Basic Equations. Navier-Stokes and continuity equations. The Reynolds equation. The Laplace equation. Load capacity, flow rate, friction. The energy equation. Laminar flow through characteristic configurations. Flow into the inlet length. Inlet losses. Turbulent flow. The flow in orifices. 5. Pad Coefficients. General statements. PADS: Circular recess, Annular recess, Tapered, Spherical, Rectangular, Cylindrical. Hydrostatic lifts, Screw and nut assembly. 6. Single Pad Bearings. Direct supply. Compensated supply. Design of single-pad thrust bearings. 7. Opposed-Pad and Multipad Bearings. Opposed-pad bearings. Lead screws. Self-regulating bearings. Hydrostatic slideways. Multipad journal bearings. 8. Multirecess Bearings. Analysis. Multirecess journal bearings. Annular multirecess thrust bearings. Tapered multirecess bearings. Spherical journal bearings. Yates bearings. 9. Hybrid Plain Journal Bearings. Performance of the hybrid plain journal bearings. Design of hybrid bearings. Concluding remarks. 10. Dynamics. Equation of motion. Pad coefficients. Supply systems. Dynamics of single-pad bearings. Opposed-pad bearings. Self-regulating bearings. Multipad bearing systems. Multirecess journal bearings. 11. Optimization. General procedure. Conditions of minimum. Efficiency. Direct supply. Optimization. Real pads. Compensated supply. Optimization. Other types of compensating elements. Real pads. 12. Thermal Flow. Temperatures in the bearing. Supply pipeline. Compensating elements. Pump. Cooling pipelines. Self-cooling capillary tube. Viscosity and temperature. 13. Experimental Tests. Hydrostatic systems: Input and output variables. Experimental rigs. 14. Applications. Machine tools. Large tilting pads. Other applications. Hydraulic circuits. Appendices. Self-regulated pairs and systems. Dynamics. Thermal exchange. (An Introduction and References are included with each chapter.) Author index. Subject index.